Atletico Madrid superstar Antoine Griezmann has reportedly denied being contacted by Barcelona over a possible summer switch. The Frenchman is among the top five leading goal scorers in the Spanish League – with 17 La Liga goals in 30 topflight appearances this season. Having spent four seasons at the Estadio Wanda Metropolitano, the former Real Sociedad forward is braced for a new challenge elsewhere. He has already been linked with Premier League outfit Manchester United sometime last year, however, the speculation about his future is expected to be sorted out before the this year’s World Cup kicks off in June. Griezmann, while reacting to the proposed move to the Camp Nou said: “I don't know where you get this information, but it is false,” he told Telefoot. He further explained that his focus at the moment is helping his side finish well in the league, meanwhile he hopes to resolve his future before the World Cup. 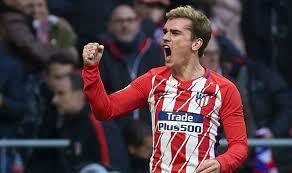 Griezmann started the season well, but at some point encountered goal drought for about two months before regaining his scoring for late last year. He has scored 17 goals and eight and also created eight assists in the Spanish League this season, while his tally for the season is 22 goals in 34 matches in all competitions.